Ferncroft Environmental are specialist ‘Asbestos Health, Safety and Training Solutions’ providers serving a wide client base both Internationally and at home in many different sectors including, oil, power, offshore, healthcare, local authorities, contracting and the demolition sectors. Ferncroft Environmental’s enviable reputation is built upon independence impartiality and integrity As with any type of legislation, specialist help is a must to guide you and assist in what sometimes appears to be a mine field. Asbestos is no exception, with over 30 years working in the asbestos removal and demolition industry, we are ideally placed to offer such help and assistance. Whether you’re looking for UKATA or BOHS registered asbestos based training, site and office audits, consultancy, help with licensing, new and renewal, asbestos surveys, asbestos management plans or simply a shoulder to lean on and an ear to listen to, then give us a call. Click 'Play' below to listen to the services provided by Ferncroft Environmental! Using a simple to use Drag and Drop platform you can produce realistic drawings for inclusion in project tenders, Plans of Work, project discussions, client liaison or any other requirement for a drawing. The program puts you within a few clicks over 160 scale 3 dimensional models (DCU's, NPU's, General Equipment, Site Cabins, etc.) 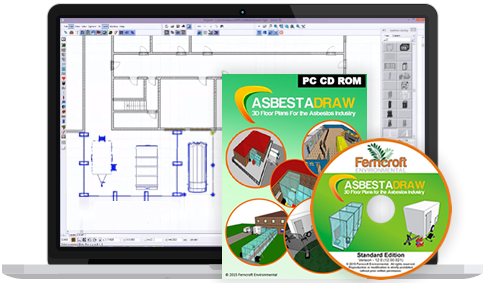 all exclusively designed by Ferncroft Environmental that will allow you to produce industry leading drawings and images. Click 'Play' in the video player below to watch a short demo of Asbestadraw!